The Florida United Methodist Center completed finishing touches on its grounds in early March, and the City of Lakeland's Beautification Board awarded the Florida Conference a certificate of merit during a City Commission meeting. The city awards the certificates to citizens or places of business in Lakeland who have made improvements to their property that contribute to the overall beauty of the City, according to Mayor Gow B. Fields. Pictured (left to right) are Florida Methodist Foundation President Rev. Wee-Li Tan, Lakeland City Commissioner at large Howard Wiggs and Florida Conference Board of Trustees Chair Rev. 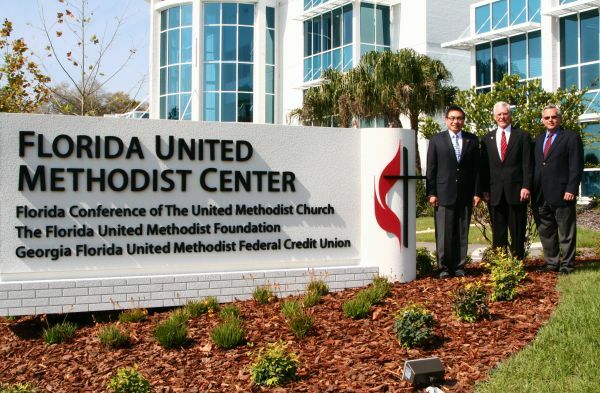 David McEntire (First UMC, Lakeland) next to the building's new signage last week.